Gmail integrates several useful options, among which we find the automatic spell correction feature. This article will show you how to enable this option. Compose a new message and write down the text. Click on the arrow at the bottom right of the message editor window. Your text will be scanned for errors. Published by deri58. Latest update on October 18, 2016 at 05:02 PM by Olivia Long. 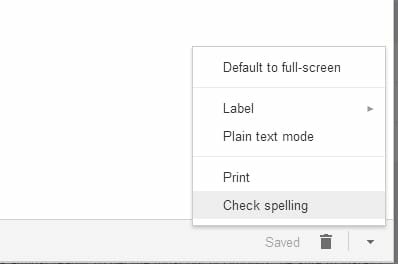 This document, titled "Gmail - Enable the spellchecker feature," is available under the Creative Commons license. Any copy, reuse, or modification of the content should be sufficiently credited to CCM (https://ccm.net/). Gmail - How to disable the Promotions tab?